Arcanum’s Carter Gray hits his second shot from the fairway of the No. 3 hole on Monday during the Cross County Conference preview tournament at Stillwater Valley Golf Course. 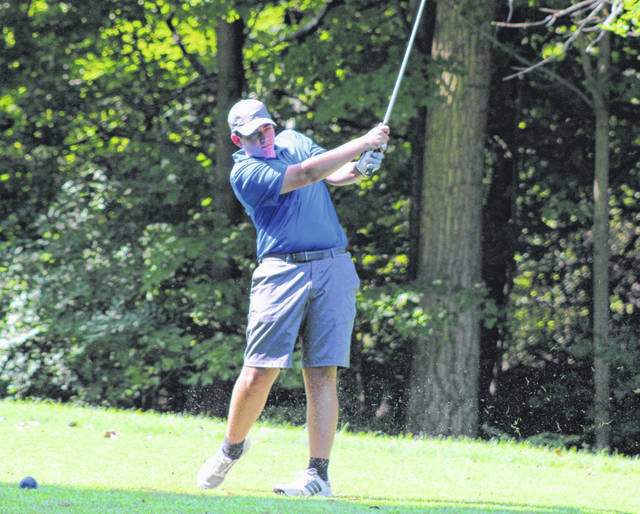 Ansonia’s Dalton Drees hits his tee shot on the No. 4 hole on Monday during the Cross County Conference preview tournament at Stillwater Valley Golf Course. Arcanum’s Jack Shannon putts from the edge of the green on the No. 3 hole on Monday during the Cross County Conference preview tournament at Stillwater Valley Golf Course. 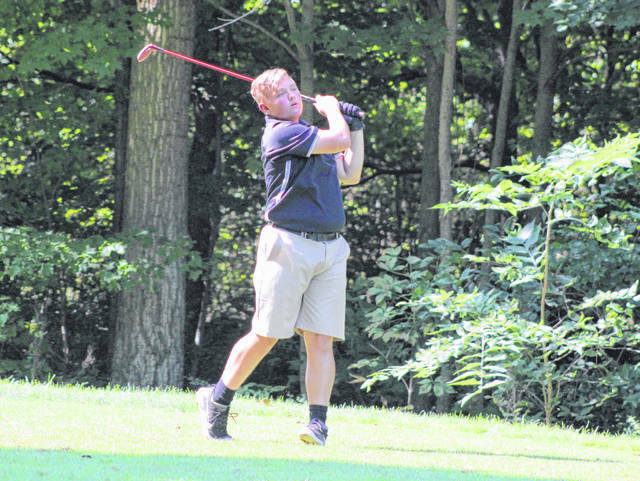 Mississinawa Valley’s Eric Sanders hits his tee shot on the No. 4 hole on Monday during the Cross County Conference preview tournament at Stillwater Valley Golf Course. 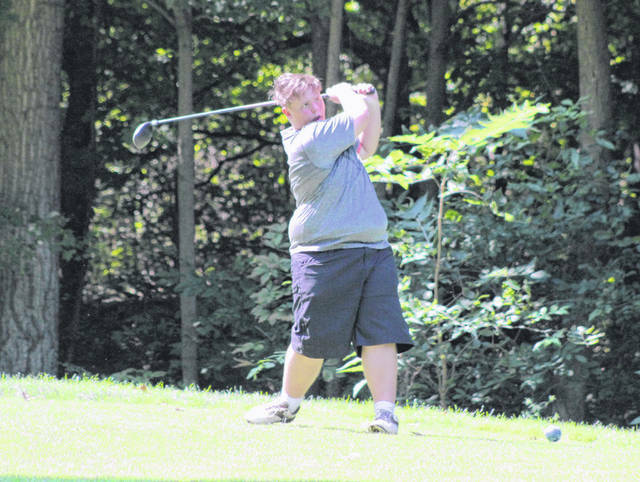 Franklin-Monroe’s Jacob Aslinger hits his tee shot on the No. 4 hole on Monday during the Cross County Conference preview tournament at Stillwater Valley Golf Course. Coaches from Darke County schools are asked to please send in their match or game results each day by email to sports editor Skip Weaver at sweaver@aimmediamidwest.com. Please include final score or other results with first and last names of players, the date and location of the event and any other details such as school records being broken, etc… you feel should be mentioned. Any questions, call (937) 569-4316. ST. MARY’S – The Greenville girl’s tennis team ran roughshod over the host Roughriders of St. Mary’s, 4-1 last Friday morning. St. Mary’s had one sharp tennis player in Claire Claywood as she dispatched the Wave’s Emily Marchal 6-1, 6-0 at first singles. Natalie Milligan evened things up at second singles by only allowing three games in two sets, 6-2, 6-1 against Allie Vanderhorst. Abby Swensen used her all-court game at third singles and walloped her opponent, 6-0 6-0 for the double bagel win against Elizabeth Sutton. First doubles tandem of Marabelle Lance and Anna Manges mangled their opponents Kara Vanaher and Lydia Babis, 7-5, 6-2, while the Wave’s second doubles duo of Felicity Lance and Faith Mansfield sent their foes Kristin Schnelle and Jenna Hawkey scurrying toward Mansfield as they slammed home a 6-3, 6-2 victory. Junior varsity doubles squad members for the Wave consisted of Emma Tutwiler and Rose Blocher who could not block enough shots at the net and lost out 8-6 to their unnamed opponents. However, the Wave’s other junior varsity players Katie Baughman and Amanda Chui chewed up their unnamed doubles foes, 8-4 for a 1-1 count on the reserve scoreboard. 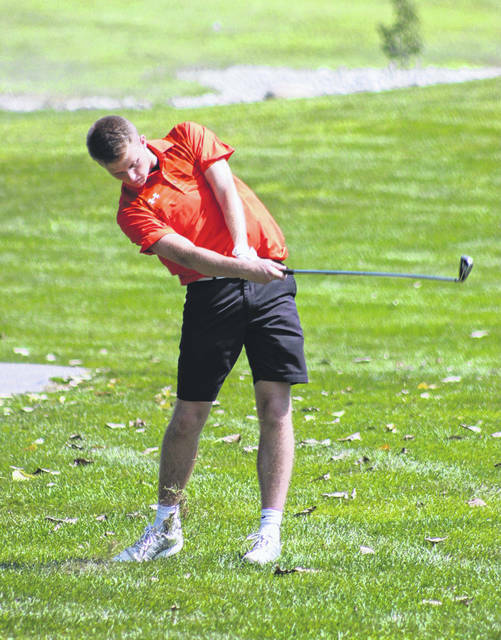 Junior Connor VanSkyock carded a 77 to place third overall as an individual in helping lead Versailles to a fifth-place finish out of 13 teams last week at the New Bremen Cardinal Invitational. Joining VanSkyock in contributing to the team score of 354 was Austin Pleiman with a 90, Will Eversole with a 92 and Alex Keiser with a 95. Also competing for the Tigers were Isaac White (96) and Brayden Robinson (106). Finishing ahead of Versailles in the team standings were tournament champion Minster with a 319 followed by Fort Loramie (332), Wapakoneta (338) and St. Mary’s (339). 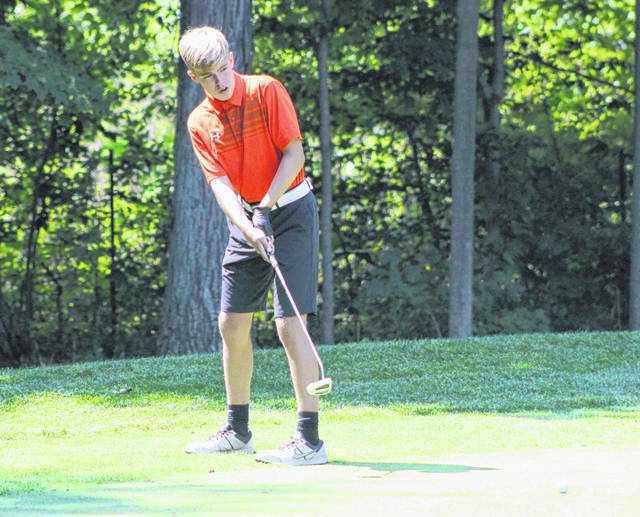 Versailles also competed in the Brookville Invitational last week at Beechwood Golf Course in Arcanum. The Tigers finished sixth out of 17 teams with Connor VanSkyock leading the way after carding an 85 to finish in 16th place as an individual. Makenzi Glancy was the medalist with a 52 as Greenville topped visiting West Carrollton 229-272 at Turtle Creek Golf Course. Also scoring for the Lady Waves, Lainey Oswalt had a 57, Riley Hunt added a 60 and Trinity Reis also had a 60.